Posted by Steve on August 1, 2011 . 5 comments. 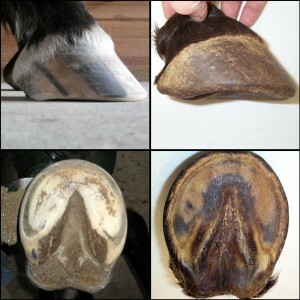 I certainly wasn’t thinking of a comparison when I took some photos of a client’s hooves the other day. As a product designer, I’m admittedly drawn to the form of a well-functioning hoof, and this older Warmblood has great feet! But as I was cropping the photos, I came across some pictures I’d taken years ago of one of Jaime Jackson’s mustang hooves, and the similarity between the two really struck me. So here they are, with the large hooves of the client on the left and the relatively small hooves of the feral horse on the right. Beautiful! Share the post "Functional Form"
I just wanted to add a couple of comments based on a conversation with a horse owner last week. Every healthy hoof exhibits two different forms of “arch,” just as our own feet do – concavity, or vaulting, where the center of the sole is higher off the ground than the outside edge; and a front-to-back arch evident in the heel quarters. The degree of arch is highly dependent on breed, size/weight, and way of going. Generally speaking, the heavier the horse, the less pronounced these two arches will be, which is why the mustang hoof in my photos has a more obvious arch in the heel quarters than the Warmblood does. To be clear – the trimmer does not create either of these arches. The hoof trimmer merely respects whatever arches are present, and works to allow the arches to develop as they will. You ought to essentially take into consideration engaged on creating this blog into a major authority in this market. You evidently have a grasp manage of the matters everyone is searching for on this web web-site in any case and you could in fact even earn a buck or two off of some advertisements. Id explore following recent subjects and elevating the quantity of write ups you set up and I guarantee youd start seeing some great focused web site visitors within the close to future. Just a thought, very good luck in no matter you do! That’s very kind of you. Of the many disciplines I’ve worked in, the equine world sadly stands out as continually perpetuating bad “science.” I hope to be able to make a positive difference in the lives of horses and their owners by both increasing our knowledge through personal research and by providing a reliable and bias-free source of information. Thanks again! first of all, I want to say I really appreciate when others share their knowledge on the web for everyone (including horses) to benefit from. Thank you! Now about the hooves: While the warmblood foot is beautiful, there are major differences between the two: Note the smaller medial half in the wild foot (naturally more weight on inside half) while the warmblood foot is trimmed for symmetry. Notice how the tubules in the wild foot curve under to protect the connection between sole and wall? I’d say there is more balance / strength in the wild foot – is it the arch? Thanks for your comments. While I certainly agree there are differences between these feet, I’d like to clarify the reasons for the differences. The symmetry of a hoof is determined by the set of (in this case) the horse’s shoulders. When a horse’s base of support (the distance between his hooves) varies from directly below his shoulders, you’ll see medial/lateral asymmetry appear, with the mass of the hoof distributed more towards the side “less under” the animal. In other words, if the horse has a very wide base of support, he will generally have “more hoof” on the outside (lateral) portion of his hoof with respect to the bones of the leg. There will also be a more upright hoof wall on the inside (medial side), presumably because the direction of impact on the horn tubules is more vertical. You’ll also observe asymmetry when the set of the horse’s shoulders causes the plane of movement described by the limb to be non-parallel to the horse’s direction of movement i.e. the horse is “splay-footed” or “pigeon-toed.” But if the hoof is being properly trimmed, evidenced by straight growth and no flaring, symmetry then becomes entirely a consequence of conformation and movement. The Warmblood, therefore, was not “trimmed for symmetry” – he’s just a more symmetrical horse! I tend to get very particular about word choices, because I’m very concerned about a proper understanding of cause and effect. So yes, the tubules do tend to curve under at the ground in the feral horse, but I don’t think they’re “driven to do it” to protect the connection between sole and wall. Rather, it’s the consequence of a whole lot of travel over very abrasive terrain, and has everything to do with the direction of impact on the tubules. The domestic horse, on the other hand, simply doesn’t move enough to experience that same bending, although we do emulate the bending/wear by applying the “mustang roll” to the domestic hoof, with the same advantages to the horse – less potential tearing forces at the white line, and easier breakover. And, finally, I have to say I disagree that there’s more balance/strength in the wild foot. I believe both feet serve the needs of each horse, which, after all, is their role. Yes, the feral horse hoof has more arch and concavity than the Warmblood’s, but that’s purely a function of the horse’s size.